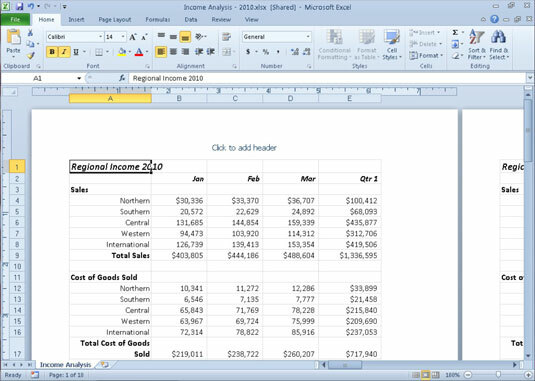 Excel 2010’s Page Layout view gives you an instant view of how printed Excel pages will look. You activate this view by clicking either the Page Layout View button (the center one) to the immediate left of the Zoom slider on the Status bar, or the Page Layout View command button on the View tab of the Ribbon. When you switch to Page Layout view, Excel adds horizontal and vertical rulers to the column letter and row number headings. In the Worksheet area, this view shows the margins for each printed page, with any headers and footers defined for the worksheet, along with the breaks between each page. Viewing a worksheet in Page Layout view. To see all the pages required to print the active worksheet, drag the slider button in the Zoom slider on the Status bar to the left until you decrease the screen magnification sufficiently to display all the pages of data. 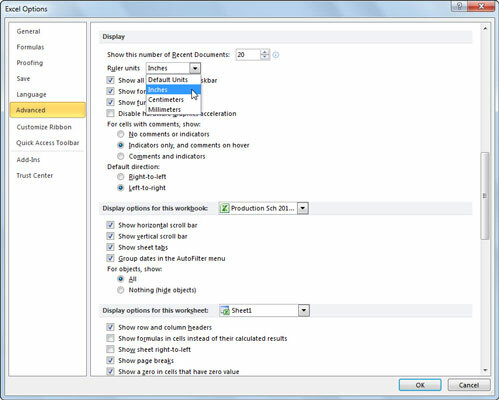 The Excel Options dialog box appears. Click the Advanced tab and then select the appropriate unit on the Ruler Units drop-down menu in the Display section. You can change the Ruler units setting to display Inches, Centimeters, or Millimeters. The new setting displays within the rulers in Page Layout view. You can turn off the display of rulers in Page Layout view. Click the Ruler check box to deselect this option in the Show group on the View tab.